I love fruit in savory salads, so much so that when I was working as a food editor in Australia, at one point my boss had to tell me to knock it off with all the fruit in the salad. There’s just something about that burst of sweetly tart flavor that marries so well with vinegar and greens. Throw in nuts and cheese, and you’ve got a a dish I’m sure to love. This is the simplest of summer salads and it’s an absolute delight. The vanilla dressing proved to be the crowning touch. I’d always had vanilla flavored dressings on beet salads so I figured the sweet blueberries would also work. Turned out to be a match made in summer heaven. Make the dressing: In a screw-top jar, combine the shallot, vanilla, balsamic, and oil and shake vigorously to combine. I like to let the dressing sit for a bit so that the shallots can soften up and infuse the dressing with their flavor so feel free to make this a day ahead. Try to make it at least 30 minutes before you assemble the salad. 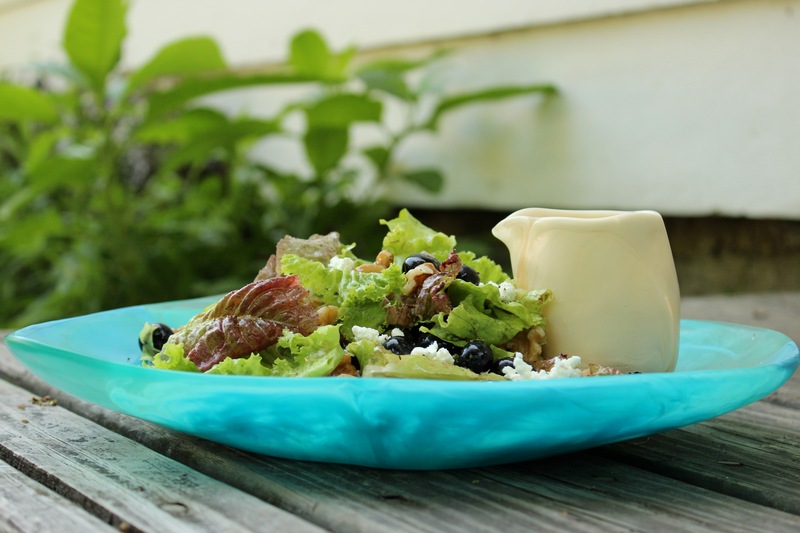 Assemble the salad: In a large bowl, combine the lettuce, blueberries, and walnuts. Add the dressing and toss to coat the leaves. Season to taste with salt and pepper, sprinkle over the goat cheese, and serve immediately. This entry was posted in appetizer, lunch, salad, side, Uncategorized and tagged blueberries, cheese, dressing, greens, salad, vanilla, walnuts. Bookmark the permalink.